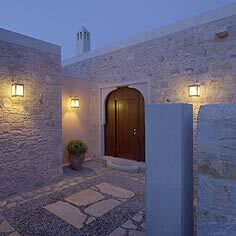 (Bodrum, Turkey) - Amanresorts announced this week that it will open Amanruya, in a quiet valley on Turkey's Bodrum Peninsula overlooking the Aegean Sea, in August 2011. The resort will be the 28th property worldwide from the Singapore-based Amanresorts. The new resort comes with 36 pool terraces, each with private pools. Surrounded by pine forests and olive groves, Amanruya (named for the Sanskrit word for peace, "aman," and the Turkish word for dream) is set on a hillside offering views of the Aegean Sea and a winding pathway leading to a protected beach. Its look was inspired by the region's traditional architecture, incorporating a series of courtyards and terraces to invoke the feeling of a village, while local materials including stone, acajau wood and Turkish marble form a timeless natural palette. Just 30 minutes by car from Amanruya lies the popular holiday town of Bodrum, the South Aegean's most attractive seaside village, and its international airport. Amanruya also provides excursions to nearby classical sites in the region, including the ancient ruined cities of Didyma, Miletus, Priene and Ephesus. Amanruya offers 36 pool terrace cottages, each featuring a bedroom with four-poster bed and writing desk; a dressing room and bathroom with soaking tub and garden views; an exterior terrace with a covered dining and lounging pergola and private swimming pool. The swimming pools vary in shape from cottage to cottage, yet measure an average of 115 square feet, and a number are heated. All cottages are fitted with outdoor showers, underfloor heating and a fireplace. The resort's central buildings include an arrival pavilion, a three-story library, a terrace and wine lounge, a boutique, an art gallery, two spa suites and four dining pavilions. A 165-foot marble swimming pool, tennis court and beach club round out the facilities.